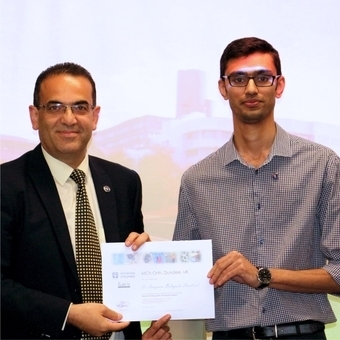 Dr Sangram Belagodu Sundresh was presented with the Department of Orthopaedic & Trauma Surgery’s Ian Kelly Scientific Paper Award from Professor Rami Abboud at the TORT Centre on 29th May 2017. Professor Abboud presents this award annually to the Master of Orthopaedic & Trauma Surgery (MCh Orth) degree student who has written the best scientific research paper submission for the year. Dr Sundresh’s research, “A prospective study to compare carpal tunnel questionnaire score to nerve conduction study result in the diagnosis of carpal tunnel syndrome” was supervised by Mr Arpit Jariwala (Consultant Orthopaedic Surgeon). Professor Rami Abboud, MCh (Orth) Course Director stated: “As part of their studies students are required to produce a Paper in the correct format of a chosen journal. This gives them valuable experience prior to submitting their work to peer-reviewed journals. Ian Kelly, who the award is named after, was a great advocate of the MCh course and indeed was a lecturer and external examiner on the course. Ian unfortunately passed away whilst being one of our two external examiners and we are privileged to name this award posthumously after him. I have encouraged Sangram and contacted his supervisors, upon the recommendation of the viva examination committee, to submit their work for publication as it will have a translational clinical impact”.